Propability were asked to create, design and produce samples, manufacture, deliver and install specialist features and refurbish existing features in the Champs Elysees, Paris, Disney Flagship store. The features created were produced as long term solutions and nearly two years on are looking as great as they did the day they were installed. The project which lasted almost a full year, found Propability supplying all specialist fixtures and fittings including; an ornate bespoke working clock, an illuminated Eiffel Tower feature, a changing colour Paris kiosk feature, the refurbishment of perimeter columns and two ornate TV surround frames. Furthermore, Propability created a Spiderman feature, a Winnie the Pooh feature with real honey smell, an interactive moving Steam Boat Willie feature with sound as well as a selection of props and displays. Working together with the Disney Store Development team, it became clear early on that Disney wanted to use a lot of back lit technology. One of the biggest challenges was finding suitable materials that could be machined but still pass the strict French fire, health and safety criteria. Propability embarked on a long search to find appropriate materials with the correct certification, adapting manufacturing processes accordingly in order to achieve the desired results. Overcoming the additional challenge of designing, building and installing a 3 metre clock, Propability were tasked with manufacturing the bespoke, giant working model to suspend from a structure that had a maximum weight baring capacity of 200kg. The internal mechanics of the clock alone were already considerably weighty. By pushing the boundaries of materials used, Propability craftsmen excelled - producing the final piece to weigh just 186kg. 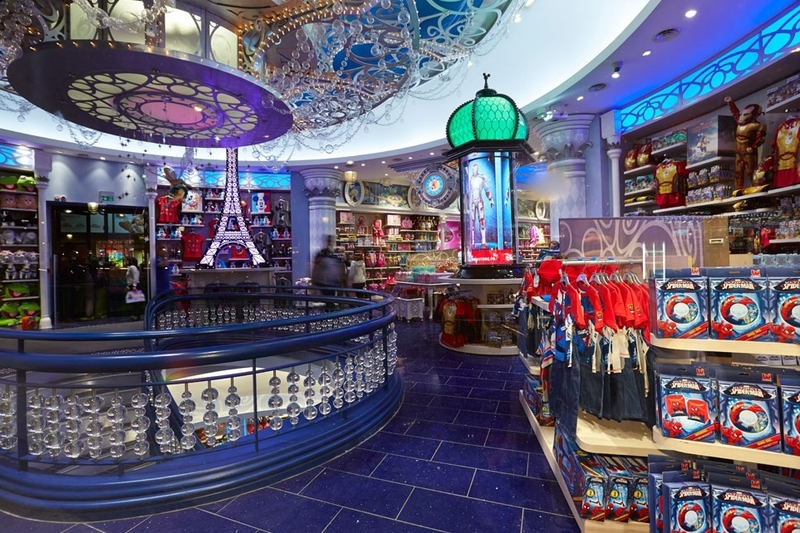 The end result created a spectacular entrance to the store - on the ground floor the beautifully crafted clock takes centre stage flanked by an impressive reconstruction of the Eiffel Tower together with colour changing kiosk features on either side.